Oh how I remember your 3rd birthday! We were supposed to celebrate your big day in Puerto Rico but unfortunately we couldn’t. I was brokenhearted that we couldn’t celebrate with la familia. However, I was determined for us to go, but God had other plans in store. Wouldn’t you know that your Titi Gladys came along to save the day! She comes up with the grand idea of meeting her up in Florida, and celebrating with you a magical Disney birthday! That was an offer that we couldn’t pass! Not only were you going to celebrate with Mickey Mouse, we were going to spend some time with la familia your titi, tío, and primos. We stayed at this beautiful resort with them, and boy was it a fun, and a magical birthday! On the actual day of your birthday we had a birthday cake for you at the resort, and you were showered by birthday gifts from all of us, Titi Gladys, Tio Johnny and your primos Kathy and Kevin. We then hit the pool to cool off on this hot summer day! The following day you visited Walt Disney World for the first time. Upon your arrival you were treated with two special pins: one for your birthday, and another for your first visit to Disney World. You were beyond excited that you were going to Disney World! You enjoyed the rides with Daddy, and had so much fun! By the time we were heading back to the resort you were out!! Once back home we had another birthday celebration with your friends. You have grown fond of your new friends, and we celebrated your birthday again at Chick-Fil-A! It really brings us so much joy to see how you’re loved by friends, and family. 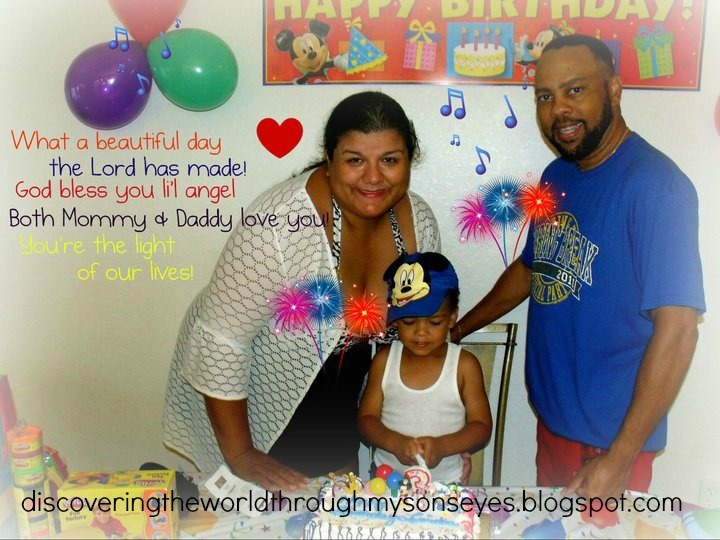 On your 3rd birthday you celebrated with your familia from Puerto Rico, and you also celebrated with your friends. We hope that you’ve enjoyed your 3rd birthday celebrations, and felt even a trifle of the amount of fun, laughter and love that you bless our lives with each day. You’re such a wonderful li’l boy, you’re our sunshine, our li’l angel. May all your wishes come true, this and every year to follow. I love reading these letters – what wonderful celebrations and I love that picture with your husband holding your son as far away from Mickey and Minnie as possible! What an awesome birthday! Totally cool. I would have absolutely loved a Disney Birthday! What a great experience and such a treat for your little guy.